A combined workshop looking at traditional music and Step Dancing from Cumbria. Led by professional Lakeland Fiddler, Carolyn Francis, and Westmorland Clog Dance Champion, Toby Bennett. Due to space limits workshop numbers are limited, to reserve your place please contact Toby. The workshop will explore tunes from Cumbria many of which come from manuscripts of local fiddle players such as William Irwin (19th century Fiddler from Langdale). Carolyn has spent many years exploring these tunes and her playing is informed by her experience of playing for dancing including step dancing. Music will be provided, though memorising of tunes is encouraged … and essential for good dance playing. Musicians need to be of intermediate to advanced standard to fully benefit from the workshop, though less experienced players who are rhythmically competent can be accommodated. The workshop is 1.5 hours long but you are welcome to stay and play for the dancing. 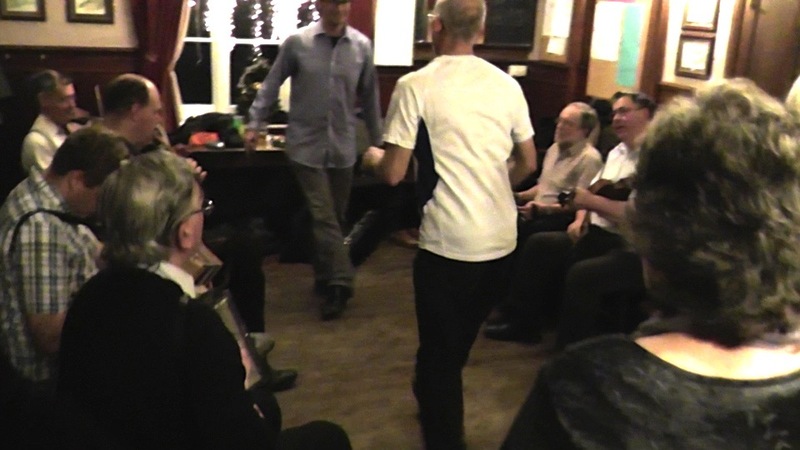 Lakeland Step Dancing (sometimes known as Westmorland Clog) is a lively, fun and showy style that was recorded in the 1960s in the area that is now called Cumbria; it can be danced in hard shoes as well as clogs. We will explore the basics, learn some of the steps and put them into simple reel type dances. The aim will be to develop confidence to explore the steps and the rhythms and enjoy stepping in an informal context, we’ll be dancing to some great Lakeland Hornpipes played by Carolyn Francis and the musicians from the preceding music workshop. Suitable for beginners or those wishing to explore the Lakeland step dance style. 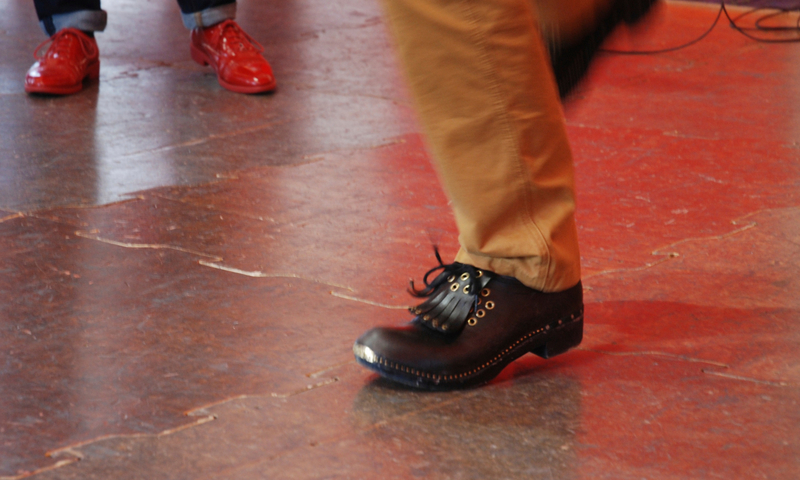 Bring some hard soled shoes so you can make some noise with your feet, or clogs if you have them. Carolyn Francis has been making a living as a Fiddler, One Woman Band, and Border Bagpiper in and around Cumbria for the last 17 years. She specialise in tunes unearthed from Lakeland Fiddle manuscripts, and loves playing for dancing, whether it be for ceilidhs (with Striding Edge band), for whole classes of clog dancing young people (with Alex Fisher) or for great solo dancers, such as Toby Bennett. Her playing is lively, rhythmical, and energetic, and she particularly enjoys improvising around tunes to bring the music and the steps closer together. She is also a great tune-smith, and is seeking to keep alive, and develop, traditional music and dance in her locality; she runs two community projects, Lakeland Fiddlers and Common Ground Ceilidh Band; and also teaches violin/fiddle in schools several days a week. Toby Bennett is a dancer and dance teacher specialising in traditional step dance, particularly the rich tradition of English step clog. An experienced performer he has performed in many countries including Europe, Egypt and the USA. His dancing combines energy, attack and speed with lightness and fluidity. Starting as a folk dancer, Toby went on to train in other forms of dance before becoming a professional dancer and later a dance educator. Now returning to his folk dance roots he draws on this rich experience in his performance and teaching of English step dance. Twice a champion clog dancer Toby has studied with numerous teachers including a number of the key figures in the clog revival such as Sam Sherry, Pat Tracey. His current repertoire includes steps from various traditional sources as well as his own dances, but he is best known for his interpretation of the Lakeland (Westmorland) step dance tradition.